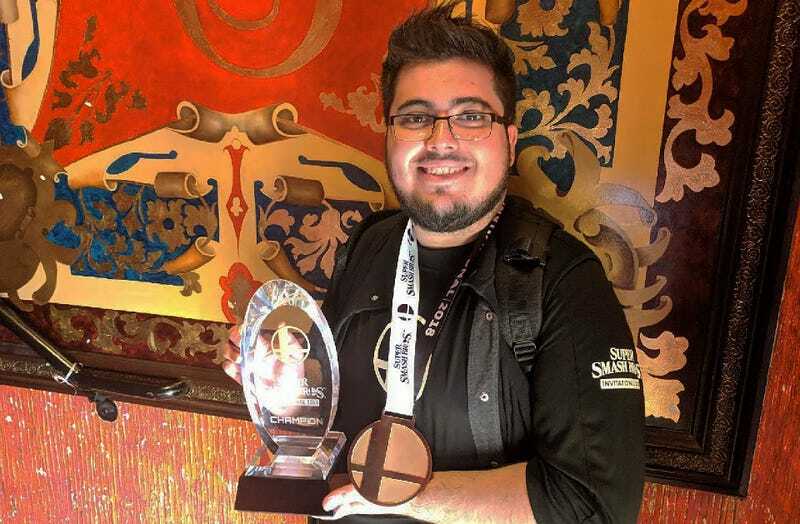 Gonzalo “Zero” Barrios was the winner of the Super Smash Bros. Invitational at E3 2018. LOS ANGELES—Paper streamers fluttered down on Smash champion Gonzalo “Zero” Barrios in the red light of a former burlesque theater in downtown Los Angeles. Barrios, the world’s best Super Smash Bros. Wii U player, winked at the camera and flashed a peace sign. Nintendo had invited him, along with seven other pro Super Smash Bros. players, to showcase Super Smash Bros. Ultimate for Switch, which Nintendo had just announced that morning. Smash is Barrios’ bread and blood, his means of employment. For him, this Invitational tournament wasn’t just a publicity stunt. As Masahiro Sakurai, the creator of Smash Bros., handed Barrios his trophy, it felt like a promise to Smash’s scrappy, grassroots competitive community that Nintendo was paying attention. Super Smash Bros. Ultimate’s premiere during the Nintendo Direct presentation on Tuesday was full of details that seemed aimed at professional players. The 26-minute-long presentation painstakingly itemized the subtlest tweaks—directional air-dodging, a redesigned “perfect shield,” reducing intangibility on excessive dodging—that seemed custom-tailored for serious players’ ears. The presentation felt like a sea change for a franchise that has in the past seemed most concerned with pitching itself to newcomers, casuals, and general Nintendo enthusiasts who love the fact that it brings together characters from the company’s 40-year history in games. But these games are also ones that pros break their backs to master. Unlike competitive games like Street Fighter, whose publisher sponsors a grand world tour, Nintendo doesn’t go to as great lengths to recognize its most competitive players outside of Invitational tournaments like yesterday’s. Behind the scenes at that tournament, the Smash pros I talked to said it feels like that might change. Super Smash Bros. Ultimate’s big hook is that it will include every character that has ever been playable in a previous Smash game. With 66 characters so far, that’s a lot of match-ups for Barrios and his peers to grok. “Everyone’s just mashing buttons and hoping it works,” said another competitor, Nairoby “Nairo” Quezada. The Invitational version of Smash Ultimate’s roster was limited: From its shortened list, Barrios and his final competitor Leonardo “MK Leo” Perez choose to recreate the 16-bit wars of the 1990s, pitting Mario versus Sonic the Hedgehog. It was a kinetic, quick, high-tension match full of surprise jabs and off-stage face-offs. Perez’s Sonic was slippery. And Barrios’ Mario stuck around a lot longer than expected, racking up damage after patiently waiting for the right openings. “I think making the game more aggressive is a good marketing decision,” said Barrios. “The faster it is, the more exciting it is and the more people watch.” The back-and-forth was more nimble than what you’d see in a typical Smash 4 match on the Wii U. In fact, the viewing experience was almost—but not quite—like watching 2001’s Super Smash Bros. Melee for the GameCube, which thousands of competitors still stubbornly cling to. Perez was referring to a moment at the Invitational tournament that elicited loud boos and groans from the audience: He devastated Super Smash Bros. Melee pro Justin “Plup” McGrath in their semifinals match with Bayonetta’s near-inescapable, deadly combo that pushed him into the air and off the stage. In Smash 4, the use of this powerful technique is divisive. Smash Ultimate is still in development, so it might be toned down before it’s released, but yesterday, Perez did it, live and on air. But in retrospect, he wasn’t entirely happy about it. All the Smash 4 pros I spoke to during the tournament were confident that they would switch over to Super Smash Bros. Ultimate as soon as it’s released for Switch on December 7. A few said that Nintendo representatives had asked them for their thoughts on the game that day, another potential indicator that the creator of Smash is ready to cater more to pros. “They had this tournament. They really cared about the tournament. They treated us like gods. They’ve been super involved in the whole competitive process. They have a Twitter account dedicated to tournaments. They definitely care a lot more,” said Barrios.